The City of Richland forms part of Washington's popular Tri-city area and is located at the confluence of the Columbia and Yakima Rivers. 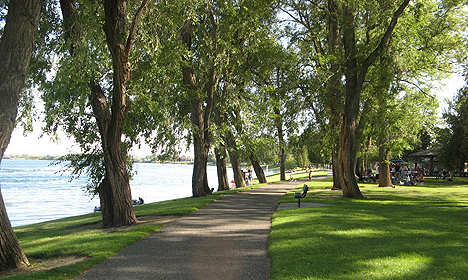 Walking path along the Columbia River in Richland's Howard Amon Park. Go Northwest! staff photo by Danielle Loparco. Richland sits at the crossroads of Washington's wine country. The Yakima, Columbia and Walla Walla Valleys comprise much of Washington's profitable and prolific wine industry. Arid, windswept deserts have given way to lush, plantations of grapes and yield some of Washington's most coveted vintages. The Tri-Cities Wine Festival is held in November and showcases Washington's top wines. Accommodations, fine dining and shopping are easily found in Richland and its surrounding area. Popular activities include golfing at any number of the area's 10 golf courses, bicycling, swimming and fishing. Long before this metropolis was established, Native Indians fished at the Yakima River. The Indian village of Chemna actually occupied this area for hundreds of years, providing a meeting place for Walla Walla, Yakama and Wanapum Indians. Lewis and Clark visited this area in 1805, and were later followed by European pioneers seeking new land and opportunities. Richland was established in 1892 by Nelson Rich and Howard Amon, who formed the Benton Land and Water Company. By 1905 the first post office was established for the newly named town of "Benton." The town's name was later changed to Richland to avoid confusion with nearby Benton City. Richland owes its population growth to nearby the Hanford Nuclear site, which has provided employment for much of the city's 43,000 residents. To accommodate the population explosion during the 1940s, the town developed "alphabet houses" whose neighborhoods were distinguished by a letter of the alphabet and a distinctive style of architecture. A driving tour of these neighborhoods can be arranged by visiting the Columbia River Exhibition of History, Science and Technology in Richland.